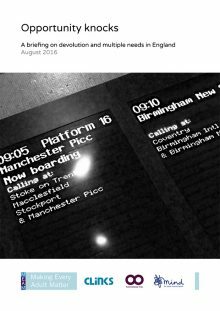 Today the MEAM coalition partners (Clinks, Homeless Link and Mind) publish a new briefing on devolution in England. It explores how services supporting people with multiple needs – such as homelessness, substance misuse, mental health and contact with the criminal justice system – can take advantage of new powers. It also sets out how tackling multiple needs can help commissioners deliver on their wider ambitions for public service reform. Download the briefing (PDF). Over the last year, a range of deals have been announced in which central government departments granted various spending and decision-making powers to local areas. This agenda was strongly associated with the previous Chancellor of the Exchequer, George Osborne, but indications so far are that the new administration led by Prime Minister Theresa May will continue with plans to devolve power. Combined authorities and others involved in negotiating deals need to ensure there is a clear, transparent route for the voluntary sector and the people it supports to engage in the devolution process. Voluntary sector organisations should take pro-active steps to engage with councils and combined authorities that have secured devolution deals. In areas that do not have a devolution deal, all stakeholders must consider what new powers from central government could help address multiple needs locally and make a strong case for them. The MEAM coalition partners will continue to call for a national strategy on multiple needs. This would help to create a policy environment where local areas are best able to adopt a coordinated, flexible approach to providing services. This should include but not be limited to new powers through devolution deals, in recognition that the pace of reform will be different across the country. Over the coming months we will be exploring these issues more fully, and working with both the new government and local areas to explore how devolution can continue to improve local responses to multiple needs.